Roberts Rock, before it slid into the sea, provided evidence of ancient vertebrate life. At first glance, they look like nothing more interesting than rocks. 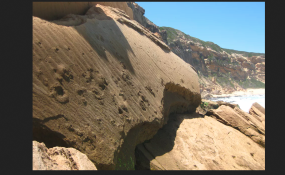 But to our research team, these two rocks - situated just 420 metres apart on a rugged, remote portion of South Africa's Cape south coast - are fascinating and important pieces of ancient history. Its 5 metre x 3.5 metre surface contained spectacular elephant trackways - the first to be reported from southern Africa. Over time we monitored its slow but steady demise. First it split in two, exposing many more tracks. By 2016 it had slumped into the sea, and was destroyed by wave action. These four animals were all members of the megafauna - large creatures - that lived during the Pleistocene. Finding their tracks on a single rock was a surprise, and we named it Megafauna Rock. An even larger rock has become exposed close to where Roberts Rock once stood. It contains multiple layers of elephant tracks, bird tracks, golden mole burrow traces and invertebrate traces - but it too is inexorably sliding down the unstable slope into the sea. There is little doubt that many other such sites have been exposed and destroyed without ever being witnessed or identified by humans.